After butternut squash dip heaped onto strips of toasted pitta, the main course. 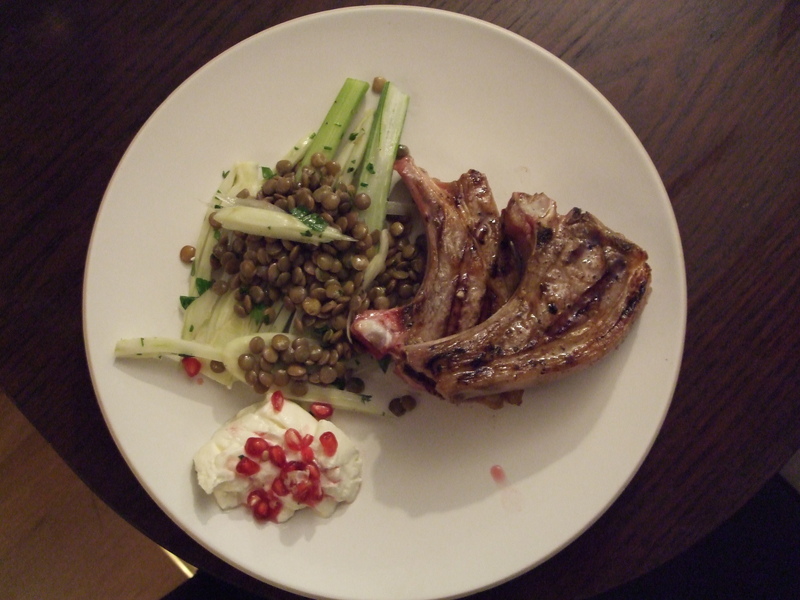 It was griddled lamb chops with a fennel and lentil salad, but that was a bit lengthy as a post title, so I’m going to focus instead on the dressing I used. It’s a good one, honestly. And maybe I’m being presumptuous, but I assume if you’re reading a food blog you can grill a lamb chop and make a salad. I forgot to mention in my last post that we also had an aperitif, a little creation of my own inspiration, which we christened the Royale Noir. It’s cava with a generous splash of homemade blackberry vodka at the bottom. It’s probably a bit more potent than is advisable, particularly if you want to do any cooking afterwards. So, luckily, this is a simple thing to prepare. Halved lemons are griddled on a hot pan until the edges start to char and the resulting juice is squeezed into your dressing; it’s a bit stickier and darker and consequently gives a richer flavour than plain old lemon juice. I have an old issue of the now defunct Waitrose Food Illustrated to thank for this idea, which they say is also good with griddled chicken, fish and halloumi. It makes sense, if you’ve got your griddle pan out, to put something else on it. I’ve got a second-hand Le Creuset thing that weighs as much as a small human and I certainly don’t want the effort of lifting it out of the cupboard to go to waste. Heat your griddle pan until very hot. Brush the cut side of the lemon halves with a little of the olive oil and sear for a few minutes, until they have caramelised golden patches. Leave until they’re cool enough to handle, then squeeze the juice into a cup. Whisk in the remaining olive oil, garlic and honey and season. Voila, doable even while tipsy! You can then drizzle a little of the dressing over whatever it is you’re griddling – I put half of it over the lamb chops as they cooked and the other half on the salad. A couple of weeks ago, I had a Sunday off, which is rare-ish for me. I never take Sundays for granted anymore, and I have decided that the best thing to do with them is to have lunch. Hardly a novel idea, I know, but I’ve let Sunday lunch slip over the years and now I want it back. When I was younger and at home we almost always had a traditional roast, which I didn’t really appreciate, being a fussy eater, unless it was beef or chicken, and we almost never had chicken. Inevitably, the leftover roast meat met the same fate on a Monday: cold beef with bubble and squeak, pork casserole, shepherd’s pie, chicken and mushroom pie. I loved that chicken pie as well. When I left home to go to university I cast aside such routines in the light of my newfound independence and desire to contradict everything my parents stood for. I couldn’t really cook much, I was practically vegetarian and I spent all my excess money in Topshop, so Sunday lunch went out the window. It only returned years later in Oxford when Tom lived a couple of doors down from a pub that we could practically roll into from bed on a Sunday afternoon. The roasts were pretty terrible. The meat was the same colour whatever you ordered. The vegetables were boiled mercilessly. The gravy had a suspicious, glossy skin on it. I was happy to let Sunday lunch go again for a while. Then, a few more weeks ago, I had a transformative Sunday lunch at the Magdalen Arms. There was a guinea fowl roasted in a Le Creuset casserole with chunks of smoked bacon and pale, creamy juice salty with smoked bacon and watercress on top. Comfort blanket mashed potato. A glass of wine. And then a very, very rich flourless chocolate and hazelnut cake with praline ice-cream and an espresso. That pretty much decided me that I need Sunday lunch in my life again. I’ve never been too attached to the traditional, British, meat and two veg school of lunching; all I want is something homemade and bolstering and company to eat it with. The following recipe is what we made for our friends Lizzy and Charlie when they came over on that Sunday I mentioned right at the start of this post. Their two year old, Ariella, didn’t eat much of it, but she had a good go. Afterwards we went for a walk and picked some sloes and noticed the acorns and autumnal leaves. It was a pretty great Sunday, as far as I’m concerned. We made this on Sunday morning, but if I had thought ahead I might have recommended making this the day before you’re going to eat it. That way you can skim off some of the extra fat – the ribs have a big layer of it and the flavour and texture of that affects the final result – and reduce the sauce down if you want it thicker. And you won’t have to start chopping vegetables before you’ve even had your porridge. Chop the onion, carrot, parsnip and celery. Heat half the oil and butter in a large casserole dish or pan that can go in the oven. Saute the vegetables with the bay leaf for about 10 minutes, until lightly golden, then remove from the pan and set aside. Add the remaining oil and butter to the dish. Season the flour and toss the short ribs in it, shaking off any excess, then brown the ribs (in batches if necessary) and set aside. Add the garlic, spices, orange zest and juice, beer, stock and 375ml water to the casserole dish and stir, scraping any residue from the bottom, then add back in the vegetable mix and ribs. Bring to the boil, reduce the heat and simmer for 1 hour 20 minutes. My smallest hob ring is still a bit hot to keep things at a simmer, so I transferred the dish to the oven at about 90c. Uncover after the time is up and cook for a further 40 minutes to thicken up the sauce. Turn the oven to 180c. Make the dumplings by combining the milk, egg and butter. Sift in the flours (I used spelt because I think walnuts go with a sort of wholemeal vibe, but the original recipe calls for plain) and baking powder. Chop the walnuts and parsley and add with the orange zest and 1 tsp salt, mixing until combined. Shape the mixture into balls – I found I needed to add a bit more flour – and add to the casserole. If you make the dumplings before the 40 minutes cooking time has elapsed, just put them on a floured tray in the fridge. Bake the casserole (with dumplings) for a further 30 minutes, or until the dumplings are golden and the ribs are tender. 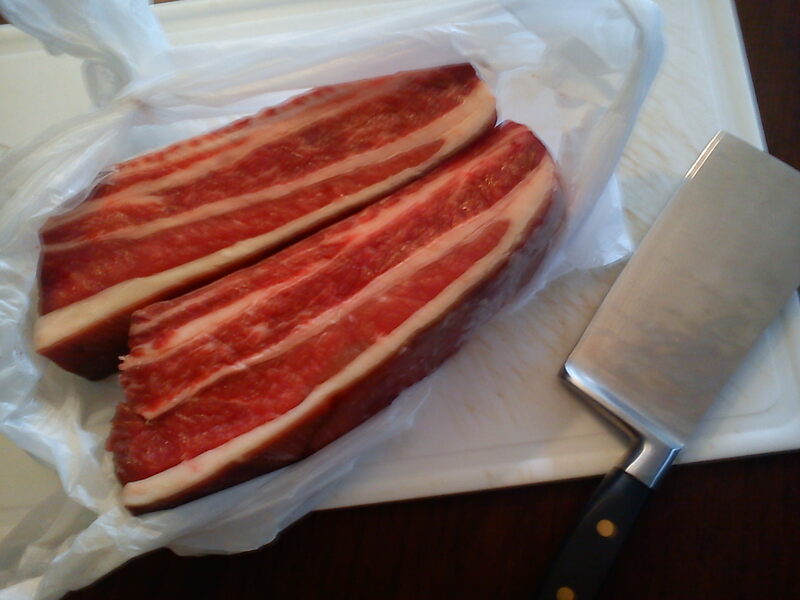 The meat should be almost soft enough to cut with a spoon.